National Academy of Engineering members Corale (1999) and Jim (2002) Brierley consider their involvement in the NAE and the National Research Council one of the most important aspects of their lives. Their membership has opened many doors professionally, and each has served on numerous committees over the years. But equally important has been the personal connections they've formed to like-minded people who share the same interests. "It's really exciting because of the people you get to meet. These are incredible professionals," said Corale, currently vice president of NAE. The couple recently decided to include the NAE in their estate plans, and they hope others will consider doing the same. "NAE has many important initiatives that are not necessarily funded by the government," Corale noted. "The only way those initiatives can be undertaken is through private donations." "I really believe in the educational component of NAE," added Jim. "Education is involved in almost everything [NAE] does." 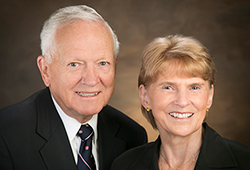 The Brierleys see their gift as a kind of "pay back," for all of the opportunities  both personal and professional  that they have received through their involvement with NAE. "We believe completely and totally in the mission of the NAE," said Corale. "It's very important that there is a voice for engineering at the highest level of government." The language link below shows how a bequest can very easily be included in your will. Please feel free to give this information to your attorney. If he or she has any questions, please contact us.